Looking for a place for your next family reunion? There’s a new option that opened this summer at Lake Bemidji State Park. The Lavinia Group Camp can accommodate up to 50 people. The site, which rents for $200/night is designed for both tent camping and RVs with five 50-amp electric hookups. The facility is the first of its kind in Minnesota state parks, according to the DNR. Located in a private area of the park, the site features a screened picnic shelter with four picnic tables, counter space and electric outlets. A large fire ring lies in the middle of the site. It also has the basics of water, two vault toilets, and grills. This project was made possible with funding from the Parks and Trails Fund, created after voters approved the Clean Water, Land and Legacy Amendment in November 2008. 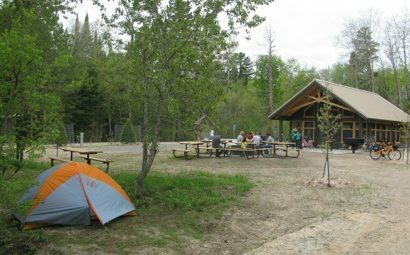 “The Lavinia Group Camp is a premier example of a Legacy-funded development project that will better meet the needs of today’s park visitors,” said Erika Rivers, director of Minnesota state parks and trails.